Ranveer attended all three of the high-profile Awards events this past week starting with a Versace suit for the Filmfare Awards, then switching into a yellow Dior one for HT Most Stylish and then finally a Julien Macdonald for the GQ Style & Culture Awards. While at a recent awards event, Preity was photographed in a Monique Lhuillier gown. And, a Versace belt helped break up some of that red. Nice as she looked, wish Ms. Zinta hadn’t picked a gown that blended in to the red carpet so. Teaming a Madison mini with a Versace graphic tee, Janhvi filmed a television show recently. Wearing her hair down, the actor rounded out her look with jewelry from Lune and pair of colorful, strappy Christian Louboutin sandals. She made the separates work! The Kapoor sisters celebrated dad Anil’s birthday on Christmas eve with close friends and family. Sonam was seen in a pin-striped dress from 16Arlington, a UK based label. Rhea wore a vintage Versace corset with a Situationist boxy blazer and A.W.A.K.E Mode pants. As a person who loves anti-fit dresses, I did love Sonam’s but overall, even with the red lip, her makeup felt dull. As for Rhea, I can imagine the joy of wearing a vintage iconic Versace corset but the fit at the cups was way off. The poster boy for all “out of the box” looks, Ranveer Singh was spotted wearing Versace & Balmain while taping an episode of Koffee with Karan. He accessorized this look with quite a few gold chain necklaces from Tanishq. The question here is did his look shine? 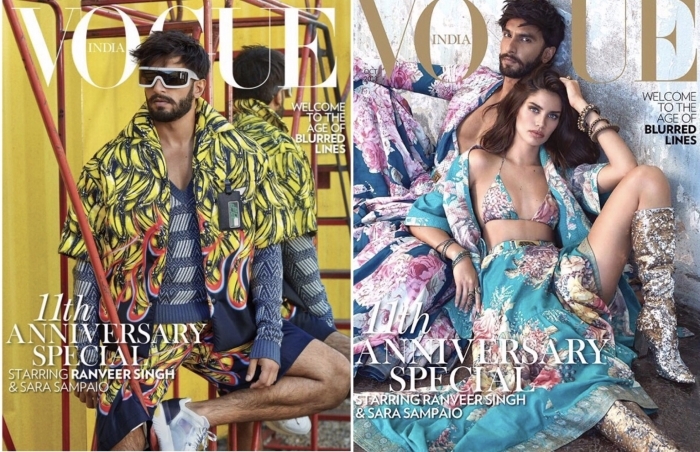 Speaking of looks, tell us what you thought of his recent Vogue covers, where he was seen in more prints, wearing Sabyasachi & Prada outfits.